Estádio João Cardoso is the 7,500 capacity home ground of C.D. Tondela who earned promotion to the Primeira Liga after being crowned Champions of the Second division during the 2014/2015 season. Estádio João Cardoso has hosted several International matches to date including a qualification match for the 2011 Women’s World Cup, and Under 187s qualifier for the Euros, however it has yet to be used by the Portuguese men’s team. Pictures of each stand to be added soon. 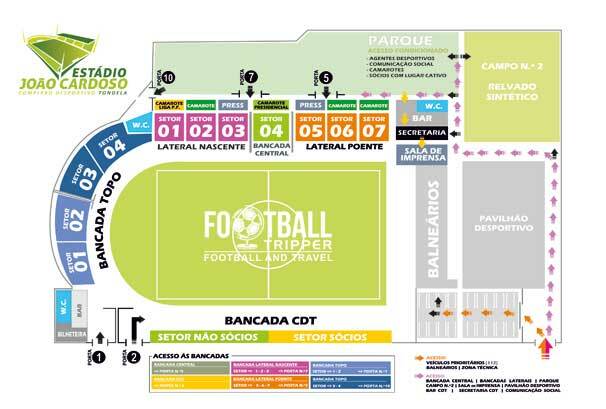 If any Spanish Football Trippers can pinpoint where the visiting supporters are located then please get in touch! Since the start of the 2013/2014 season there has been a dedicated club shop at Estádio João Cardoso, as well as CDT’s official online store. As there’s very little information online regarding the shop’s opening times, you may have to assume that the club shop is only open on matchdays. It doesn’t look as if there are any tours available of the facilitates Estádio João Cardoso, sorry. Tickets to see C.D. Tondela have never usually been sold online which means you will have to purchase them either in the week leading up to the match or just before kick-off. As the yellow and greens rarely sell out their stadium, this doesn’t usually pose any problems – just remember to get there early. Expect to pay around between €14.00 – €18.00 for a top flight ticket. Estádio João Cardoso is located within a prime location less than 900 metres south of Tondela’s historic centre. This means that the average Football Tripper can easily stroll to the ground in 10 minutes maximum. There’s absolutely nothing to suggest that there is an on-site car park at the stadium so you may have to be flexible with where you leave your car. The municipality of Tondela isn’t blessed with its own railway station. A crane in background which alludes to the ongoing renovations at Estadio Koao Cardoso. The closest major airport to Tondela is Francisco de Sá Carneiro Airport in Porto approximately 150 km away to the north west. To the east of the stadium just off of avenue Dr. Francisco Sá Carneiro there is the Hotel Severino José. Due to the compact nature of the city centre this is actually in quite a good location.